Our customer needed a way to put a guard at their entrance road to check trucks and visitors into their facility. Little Buildings had the answer with a 5&apos;x10&apos; guardhouse large enough for two guards and their equipment. Optional air conditioner and tinted insulated glass helped them keep their cool even in the hot Southern climate. Two tone paint matched corporate colors. Standard features found on every Little Buildings guard house include all welded galvanized steel construction for years of rugged use, 3" canopy overhang with downspout, painted steel work counter with storage drawer, sliding door with maximum security hookbolt lock, clear tempered safety glass windows, galvanized steel treadplate floor, and paint color of choice. Electric features include electric heater with thermostat, fluorescent light with lens and wall switch, electrical outlet with ground fault protection, and all wiring to a wall mounted circuit breaker box. Your preassembled guardhouse can have optional features such as air conditioning, tinted glass, additional doors, transaction windows, tile flooring, anti-fatigue mat, roll down shutters or sun shades, elevated platforms with stairs, stainless steel counters, and much more. We build standard sizes and models as well as modified and custom units. 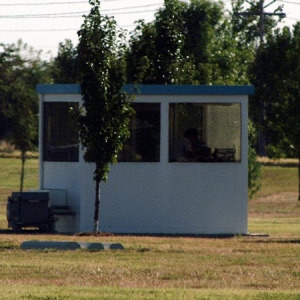 We also manufacture bullet resisting guardhouses for high security areas like pharmaceutical companies, military installations, water reservoirs, and power plants. Contact us and see what we can do for you!